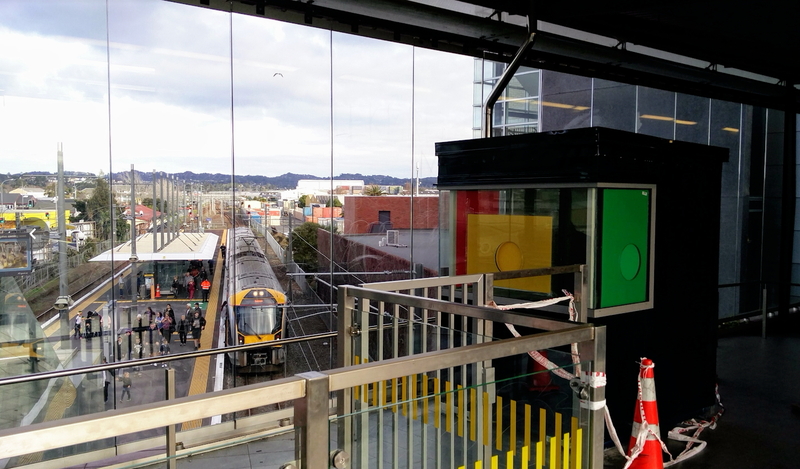 As part of changes to the rail network, Auckland Transport are gating a number of stations to complement the stations that are already gated. 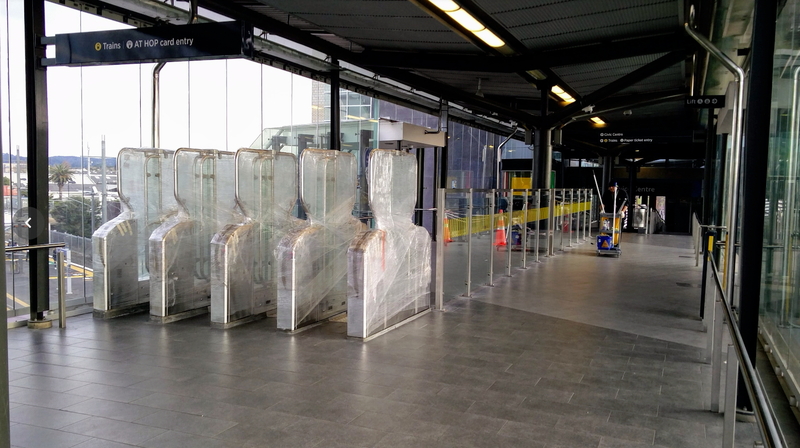 The gates are going in at Otahuhu, Henderson, Manurewa, Papatoetoe, Middlemore, Parnell, Papakura and Glen Innes stations. I popped down to Henderson the other day to see how the progress on them was going. Henderson is possibly one of the easiest stations to gate as it only (currently) has an entrance at one end of the platform so only one set of gates is needed. Here you can see the gates still wrapped in plastic. Unlike the gates at the previously gated stations, you can see they’ve gone for full height gates. You can also see that despite taking up over half of the width of the concourse over the tracks, there is still plenty of space for those using it as access over the tracks or to the council buildings. At the opposite end to the gates, a booth will presumably be for staff to provide customer service and keeping an eye on the gates, including the gate for those with paper tickets. 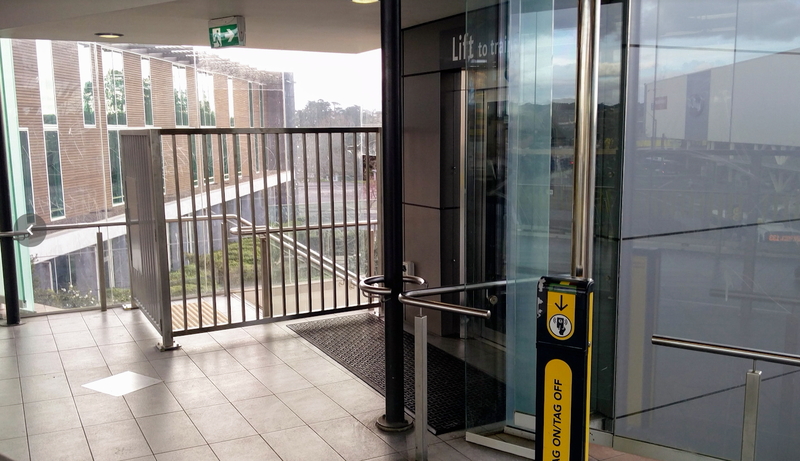 The stairs have been gated off while there is a tag post that has been installed near the lift. Presumably the person in the booth will be keeping an eye on those using lifts. And finally an image looking back the other way. You can also see at the end on the left a HOP machine. I assume the one that remains on the platform will be moved next to it after the gates go live. Group Manager AT Metro Operations, Brendon Main, says AT recently announced a package of customer service and safety improvements under its Safety and Fare Enforcement (SaFE) project. This includes more electronic gates and the testing of a new role on the rail network. The Transport Officer role has been created in response to legislation due to be passed by Parliament next month. He says new legislation is expected to provide Transport Officers with warranted powers to enforce fare payment by everyone travelling on Auckland’s trains, they will be able to issue infringement notices to fare evaders as well as provide assistance to customers. Mr Main says 18 Transport Officers are currently being recruited and will work initially on the Western Line to test the new legislation and scope of the role. He says the use of Transport Officers will be extended across the rail network and at least 120 could eventually be employed subject to the outcome of ongoing consultations. He says Transport Officers, along with other staff, will act as a point of contact for incidents on the rail network and at stations They will help with emergency management through a close working relationship with the Police and Transport Operators. As part of the City Rail Link works, Henderson will be gaining extra platforms and access from the southern end of the station. Oh and why are they future proofing the new platforms to be up to 200m when they aren’t doing the same for the CRL stations? I saw these at Otahuhu yesterday too, already installed, but not yet in operation. In regards to the short platforms on CRL, thinking of it, if the we need so much more capacity, then they won’t have a choice, but to increase the frequency. I personally think frequent short service is more desirable than less frequent long service. Or am I completely off the tracks? Why the heck would they spend that amount of money for a station that has so much wrong with it, low passenger numbers being the least of its concerns. Gating Parnell will mean fare evaders coming from/going to further out suburban stations will not be able to get to/from the central city. As is it now, Newmarket and Britomart are both gated which leaves Grafton and Parnell as ungated destination stations for those people looking to for a free ride into the city. Gating Parnell would mean that fare evaders could no longer use as their way into/out of the city. I do agree that it does seem like a waste of money for a poorly located station, but can see the reason behind it. I would suggest that if you can find and reach the Parnell Station, and a train that actually stops there, perhaps you should ride for free? Or at least gain a certificate. This would address our lack of steps and obesity in the general population also, so the health benefits would easily cover lost fares. “Oh and why are they future proofing the new platforms to be up to 200m when they aren’t doing the same for the CRL stations?” EXACTLY!!! I still can’t get my head around how blasé that manager was about future-proofing the CRL. Gee. There may be more staff on some of the services than passengers soon. What? They are hiring 18 people that is way less than one person per service. The Sydney transport officer equivalent work in teams of 2-4 and start at each end of the carriage when checking tickets, 4 allows them to upstairs and downstairs at once. I seem to have a thing about interruptions with ticket inspections. I don’t know why. If it leads to a decrease in vandalism and evasion great. I travel on the western line and haven’t noticed much anti-social behaviour but have heard of more of it on the southern. Yet the western line is to get the initial focus. What’s the purpose of the new personnel to be? They are warranted ticket inspectors, they have the power to enforce and infringe fare evasion. The current ticket inspectors do not have this power. I don’t see why they couldn’t make one of those gates wider like at New Lynn. Right now I have to lift my bike over the gates to get through. Aparrently bikes will have to go through the paper ticket gate (or the lifts) which makes it even less convenient than it already is. When a bike’s too heavy to take on the escalators (e.g. some ebikes or when loaded with groceries) it’s often a struggle to fit them in the tiny lifts. I assume it’s even harder for some people with large prams. Since the lifts are so small it’s also necessary to wait in line for it sometimes as it’s hard to fit more than one person + bike in them. But that gate could easily be a metre wider to accommodate bikes. Future proofing platforms for 9+ car EMUs? Yeah, great. So it’s fine to open certain doors on the six car sets but…..oh god I can’t see this ending well. Same silly design as Britomart, where you need only use a lift to bypass the gates. At least this one should actually have eyes on it. Is it not possible to add HOP to the lift itself? Nope, the lift will be operated from the Kiosk, staff will only call the lift after confirming the person has tagged on, otherwise lift will remain locked. Is that seriously the solution AT have come up with in 2017? That will be great when the kiosk has the ‘back in 5 min’ sign up! What about fare evaders arriving at Henderson andusing the lift to ecit the station? Yes I wondered the same thing. I think that lift is going to be very busy. What about the thugs that just jump the fence and tracks next to the main bus stop? Flip just keeping an eye on the lift, guess layout was impossible without redoing the concourse? Grafton will be hard to gate by the sounds of it & why not done already. “Presumably the person in the booth will be keeping an eye on those using lifts”. Like how they keep an eye on the CCTV in the trains and stations. Yeah right. Not much point in having security if you’re not going to apprehend offenders. Have also heard that the overbridge will be closed when trains not operating. Apparently to cut down on vandalism. Really? Ok maybe the council workers don’t work while trains aren’t running, but what about the businesses next to the council building? Early or Late workers penalised by having to walk around the block? Great this is finally gated. The minute the new glass was put up it was already itched with tagging. 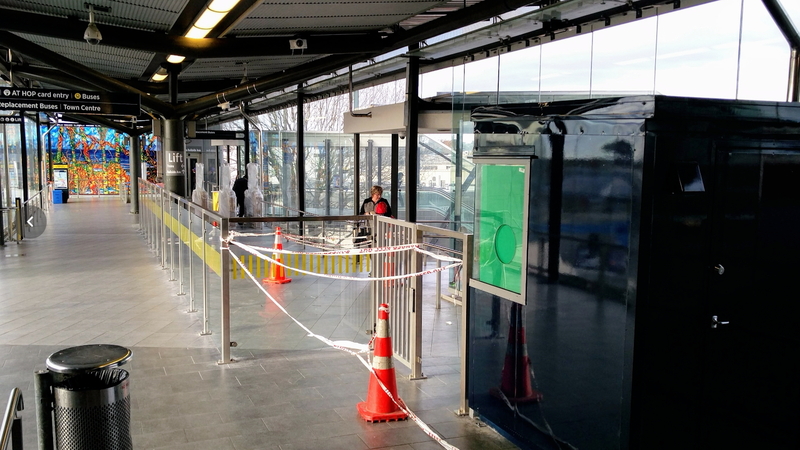 Not sure why Auckland transport haven’t done more to stop this at this station. The graffiti is everywhere on the bridge and entrances making the place feel grotty and unsafe. If only there were Auckland Transport offices nearby who could take notice of such issues. Hopefully there will be a vast number more than the initial 18 Transport Officers taking into account they will be spread over 3 shifts daily, days off, sick leave, leave, etc. There is not going to be much fare enforcement otherwise and the word is it will not only be trains they’re used on. Well apparently that is just for the trial (which by trial one would assume this is before removing TM’s), and they plan to get 120 later on. For reference according to AT there are currently 160 TM’s. Apparently they are planning to have teams of 2 transport officers per train… so that would mean they need 320 transport officers to maintain current levels of staffing or you will end up with some non-staffed trains. You would likely also need more than that as frequency and hours of operations improve and if they decide to have some officers working on platforms as they have indicated. Trains are already bad enough, especially when its a 6-car and the TM is in the other set, things get chaotic, I have seen people smoking (not just cigarettes), vandalizing, being racist and yelling at other passengers, screaming, talking about their fare evasion, trying to steal things etc. Even on PEAK trains. So yeah… non-staffed trains? yeah-nah. I noticed at Henderson station that the trackbed between the up main and railside ave has been excavated. Deep enough to expose the concrete footings for the overhead electric support pylons. From the concourse to the old station platforms. Could this be preparation work for new rail line or loop, or is itfor some mundane purpose? Wow so they’ve blocked the stairs, and the lift is only going to operate when the person in the kiosk confirms that the person has tagged on/off? What a pain! And those escalators are so often broken/stopped (I have a ticket in right now for the handrail which stops periodically, making it very hard for me to use the escalators). The gates are already congested when a train has recently arrived as well, definitely not enough gates (though I know that is limited by the space available in the overpass), and it is a pain to have to walk all the way around (I work on the council side of the overpass). I did see a cycling person from AT come to have a look, not sure what they think of the gating layout. I think they really need that other exit built to take pressure of that exit and bridge. The issue with the other exit is most people head towards West City and its not the most pedestrian friendly of entry places so most people may continue to go to that exit. Ideally one day in the future the station is a more comprehensive transport centre. Currently it must be a real nuisance to do bus transfers there. In winter, Henderson station is a rain and wind-swept horror of a platform as the weather often blasts in from the south with considerable violence as happened many times last winter. Could the railway and Railside Avenue be roofed over from the southern side of the station to the wall of the mall with the weather side of the station fitted wit ha windbreak. Also the lifts provided at Henderson are too small for my make of mobility scooter, a PRIDE 140XL Pathrider, this machine is 1.475metres from front to back minus the shopping bag. If in future the existing escalators are replaced, that travelators be installed as mobility aids can use these.